The Smith and Wesson Combat Magnum .357 Magnum revolver, sometimes known as the Model 19 or Model 66, went into production in 1955 and was discontinued in 2005. At the time of its introduction, the Combat Magnum was the world’s lightest .357 Magnum revolver. The new and reintroduced .357 Combat Magnum is a fine revolver. A sensation when first introduced, the Combat Magnum became one of the most popular handguns of all time. The Combat Magnum was the revolver everyone wanted and arguably the finest service revolver ever fielded. In terms of power, accuracy, and fit and finish few modern service pistols equal Smith and Wesson’s best revolver. The .357 Magnum cartridge, originally introduced in a heavy frame handgun, was mated to the K frame revolver in the early 1950s. The revolver was a result of brainstorming among influential shooters. Carl Hellstrom, president of Smith and Wesson, approached Bill Jordan concerning Smith and Wesson service gun development. Jordan was an influential shooter, former Combat Marine, border patrolman, and exhibition shooter. Jordan recommended Smith and Wesson lengthen the cylinder of the .38 Combat Masterpiece to accept the .357 Magnum cartridge. With target sights and a ramp front sight, this revolver would offer high visibility sights and all the accuracy needed. The revolver needed a shrouded ejector rod. The new short double action trigger was ideal for fast double action shooting. Jordan also recommended the revolver be supplied with target stocks to help control the recoil of the .357 Magnum cartridge. Officers could practice with .38 Special ammunition and load the .357 Magnum for duty. Smith and Wesson studied metallurgy and determined that the K frame revolver could withstand the stress of the .357 Magnum cartridge. The result was the Smith and Wesson Combat Magnum. This is the revolver that Jordan called a peace officers dream. It was particularly well received by highway patrol agencies that traditionally needed more vehicle penetration than urban officers. With its smooth double-action trigger and red insert front sight, the Combat Magnum offered excellent first shot hit probability. The shrouded ejector rod protected the ejector rod from damage. Hand filling stocks allowed excellent control. The .357 Magnum is an excellent man stopper, so there were no complaints there. In 1957, Smith and Wesson went to a numbering system for reference for handguns while keeping the original named models as well. The Combat Magnum was given the Model 19 designation and later stainless-steel revolvers were dubbed the Model 66. The Combat Magnum remained the premier service revolver for police agencies well into the 1980s. When the Combat Magnum was introduced, Bill Jordan and others recommended the practice regimen should consist of 20 rounds of .38 Special for each .357 Magnum cartridge. Court cases and liability concerns, as well as a realistic look at police training, led to qualification with the duty load. Some agencies practiced on a monthly basis, a high standard. They were well armed, well qualified and seldom missed with their magnum revolvers. Wear and tear on the small parts and revolvers going out of time became common. Smith and Wesson instituted several fixes with a solid gas ring and other improvements. By the introduction of the 19-4—about 1975—the Combat Magnum was an improved revolver. The design of the frame—a cut out for the ejector rod—proved a weak point and there were cracked frames in this area in high round count handguns. 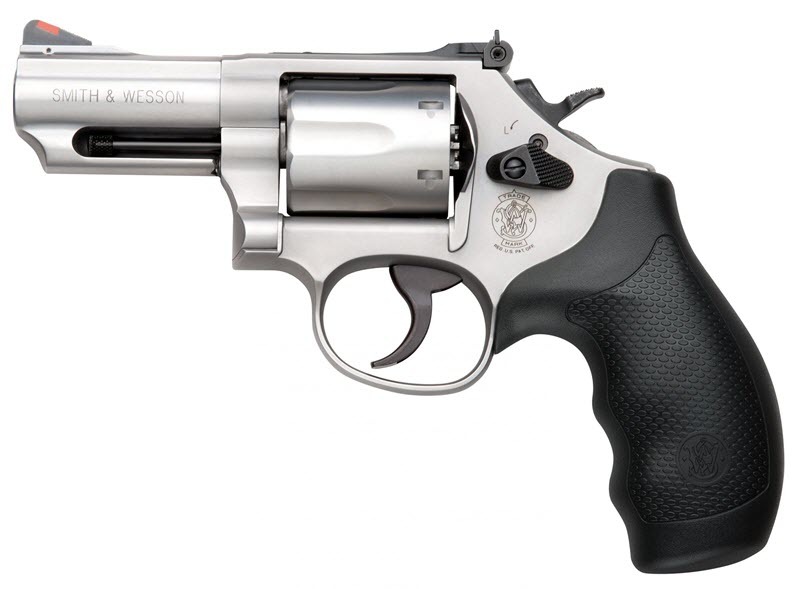 Smith and Wesson introduced the L frame revolver. This was a revolver with a frame midway in size between the K frame and N frame revolver but with a grip frame the same size as the K frame revolver. The L frame was a good revolver but came on the scene as police agencies were making a wholesale move to self-loading pistols. The Combat Magnum continued to enjoy popular use, especially among civilian shooters. During its long service life, the most popular issue revolver was the Model 66, a stainless steel Combat Magnum. This revolver is still in use with elite units based on its reliability, accuracy, and power. It is corrosion resistant and not dependent on perfect ammunition for function. The Combat Magnum is a desirable handgun for home defense and those wishing to own the finest medium-frame revolver ever built. The .357 Magnum cartridge is a powerful number well suited to defense against man or beast. A decade or so ago, in 2005, the Model 19 and Model 66 were discontinued after a 50-year production run. Demand had lessened, and expense was another reason. All revolvers are increasingly expensive to manufacture, at least the quality variants are, and demand skill in hand fitting. The L frame revolvers took the place in the lineup of the previous Combat Magnums. Today, the Model 66 has been reintroduced. This revolver features precision machining thanks to CNC technology. The new Model 66 features tight cylinders and cylinder throats and offers excellent accuracy potential. This revolver remains an excellent choice for all around use. Smith and Wesson introduced a very different Combat Magnum, the Model 69. The Model 69 is actually an L frame revolver with a 5-shot cylinder chambered for the .44 Magnum cartridge. This handgun is best served with .44 Special loads. It remains a formidable handgun for specialized use, but in my opinion, not nearly as versatile and the .357 Magnum versions. As of 2018, the Combat Magnum is alive and well and very much appreciated. Do you own, or have you shot, one of these legendary revolvers? Tell us about your experience in the comment section.